A Yellow Eyed Penguin waddling along the sandy shores near Dunedin on the South Island of New Zealand. The footprints of this Yellow Eyed Penguin head back towards the water as he has completed his day of fishing and begins waddling back to his home. When you look across the beach, this cute little fellow is not the only penguin waddling on the beach near Dunedin, New Zealand as all his friends are close by. 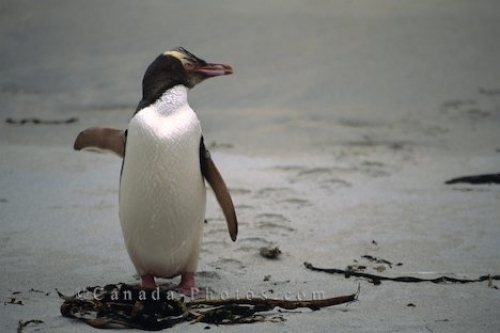 Picture of a cute Yellow Eyed Penguin enjoying his day waddling along the beach on the South Island of New Zealand.